Call them spells, prayers, affirmations, programs, rituals, visualizations, or meditations. It matters not what name you give to your magical machinations. The real magic comes from your ability to focus your personal power, infuse it with your desire and intent, and then release it out into the universe. When I work spells I like to use the tools I know best: candles, quartz crystals and tarot cards. I use the cards to represent the people and circumstances involved in the situation that I wish to create. I use the candles to help invoke the goddesses, gods, entities, or guides that I will appeal to for help in reaching my goals. I use the quartz crystals to augment my personal power and direct it outwards. In tarot divination, the beautiful artwork, rich symbolism, and archetypal images portrayed on the cards help the reader bypass the limitations of the individual conscious mind and dip deep into the collective subconscious for impressions about the past, present, and future. A similar principal holds true when the tarot cards are used for spell work. Since the tarot is universal in scope, the complete spectrum of reality is portrayed by the symbols on the cards, with every conceivable scenario of experience represented. 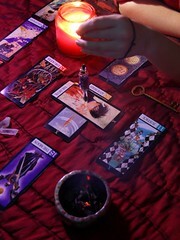 The first step, whether you are personalizing an existing tarot spell or creating one of your own, is deciding exactly what it is that you want to accomplish. Next, assemble the tools you’ll need to complete the spell. Create a proper atmosphere for spellcraft by preparing yourself and your altar or work area as you would for any sacred ritual. Set out the various items for the spell. Center and ground yourself with several deep breaths or a few moments of quiet meditation. If your spell calls for candles and incense, light them and then invoke your deities or guides. Study the cards that represent your desired outcome. Always speak the words of the spell clearly and with conviction. Focus on the outcome as if it has already been accomplished, and then release it out into the universe. As you snuff out the candles and incense, thank the attending deities for their assistance. The secret to success in spellcraft lies in your facility for visualizing your goal as clearly as possible and directing your energy toward it with total concentration. After choosing cards that portray what you want to achieve, focus your attention on the tarot’s images. Make up a story based on the scenes depicted on the cards. Infuse your intent with desire and let it go. Trust that it is working. If you are using your tarot cards for divination, spellcraft, and personal development exercises, you’ll definitely need to own several different decks. Some spells specify that you should leave the cards out where you can see them, place them in a spell box, or carry them around with you for a period of time. Others may require that you write on them, sew or bind them together, or even burn, tear, or bury them. Moreover, you may not want to perform readings with the same cards you’re using for your spell work. Fortunately, most popular tarot decks are relatively inexpensive. Also, you can usually find used tarot decks for sale on eBay, at garage sales, or in used bookstores. Another idea is to scan or photocopy your deck, and use the printouts or copies instead of the actual cards in your spell work. The most important thing to remember when performing any spell is that you need to believe in what you are doing for it to work. Although tarot cards and other tools are extremely helpful when performing a spell, the real magick comes less from the spell’s elements than from your own power and belief in a successful outcome. Whenever possible, you should also take action in everyday life to help your spell along. Use this spell to help find a lost pet or entice a runaway to return home. In the following example “A” is the signifactor, a woman whose pet cat has run off. The woman and her cat are represented by the Queen of Wands. The cards used to bring the cat home are: 2) Six of Cups — nostalgia, renewal of old ties; 3) Strength — overcoming obstacles; 4) The Star — hope, healing, progress; 5) Ten of Cups — home, family, happy reunion. By my will — It is done! Focus on the end result as if it has already happened. Hold the image for as long as you can, then let it go and release it out into the universe. As you snuff out the candles, thank Artemis for her help. Place the cards, crystal, and herb in a spell box, envelope, or drawer and keep safe until the desired outcome has been achieved. Choose a significator to stand in for you. Pick the cards, candles, and essential oil that best convey the outcome you desire. As I will it, so may it be! Make up a little story based on the cards you’ve chosen. Focus on the end result as if it has already happened. Hold the image for as long as you can, then let it go and release it out into the universe. After you snuff out the candles and incense, place the cards and crystal in a spell box, envelope, or drawer and keep safe until your desired outcome has been achieved. Leave your crone’s amulet on the window sill overnight so that it can soak up the energy of the dark Moon. In the morning put it in the pouch or bag. Carry it with you wherever you go. Use this house blessing to cleanse your home or office of negative vibrations. The best time to perform this clearing ritual is on the night of a new Moon. Leave the cards in place until the next full Moon. As you collect the cards, you may offer a brief thank you to each for assisting in this ritual. The purpose of this charm is to draw new love into your life. It will attract new friends and acquaintances. Among those who become your friends, there may be one who will become your special someone. The charm itself won’t cause another person to fall in love with you. You will have to accomplish that on your own. The only materials you need to construct the charm are a couple of cards from an old tarot deck, and some pink or red thread or cord. Choose a card to represent yourself, and another one to represent your ideal love. Study the card you’ve selected as your representative. Imagine that you’re transferring your inner essence into the card. When you look at the card, imagine your own face looking back at you. Study the card that you’ve selected as representative of your soul mate. This card should not refer to a specific person, but rather to someone you hope to meet. Now, you are going to infuse the card with a composite of the traits you are looking for in a lover. Imagine that you are transferring all those qualities into the card. Take your pink or red cord or thread, and tie the two cards loosely together. Place them somewhere where they won’t be disturbed. You should meet someone within a few weeks. If after you meet that person, the relationship does not work out, be sure to unbind the cards. If no lover appears within two months, dismantle the charm by untying the cards and returning them to the deck. Wait about a month and then try constructing the charm again.